This book is an enhanced collection of Dr Maths newspaper columns answering queries from readers about their maths questions and concerns. Contains 40 stories on topics as varied as The Perfect Body, Global Warming, Mobile Phones, Deal or No Deal, Lucky Numbers, What is Average?, Finding Mr Right, Golf & Horse Racing, Coin & Card Magic, Mad Hatter’s Tea Party, Premium Bonds and Coco Chanel to name but a few. 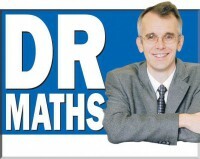 Also includes 40 Dr Maths puzzles with answers.